Tonight's Sunday Dinner was another Caribbean inspired summer meal that came together rather easily with fresh, clean ingredients. Tilapia is almost always on sale at my local farmer's market and Penn Dutch, where I've started buying most of my meat and seafood. Today it was $3.99/lb, making this an incredibly affordable meal, whether you're cooking for yourself or the whole family. If you're lucky enough to see prices that low, buy some extra fish and freeze it for another dinner! 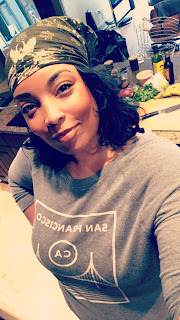 Speaking of which, my son is now in Virginia visiting my parents for the summer, so I'll be cooking for myself over the next few weeks. 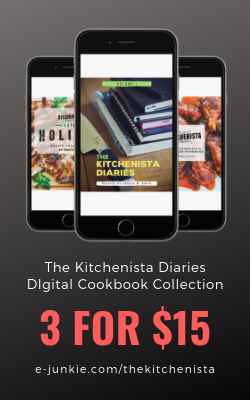 I admit that can be a challenge but I'd love to show you ways I make it work and still keep dinner interesting. You may have seen my post for Jerk Beef Short Ribs a couple weeks ago, where I included my recipe for homemade jerk marinade. I used the same idea here, adding lots of fresh ginger. 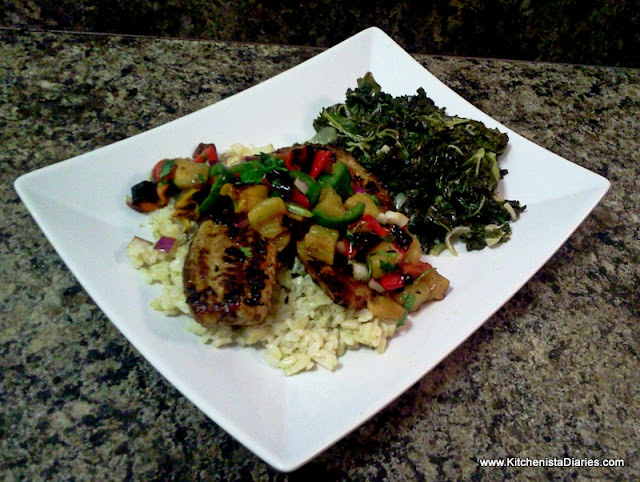 Fish doesn't take long to marinate, so you can prepare your side dish and salsa in that time. Tonight's sides were brown rice and Coconut Braised Kale, a vegan dish that was so delicious I almost just had that for dinner by itself. I've made plenty of salsas with pineapple before, but taking the time to grill the pineapple first really brings out its sweetness. This was the first time I've cooked mini sweet peppers and I was delighted by how easy they are to prepare on the grill. I'm already brewing up some more ways I'd like to use these peppers in other recipes! They're just a little sweeter than red or yellow bell peppers, so if you can't find these in your grocery store regular bell peppers will do just fine in this recipe. 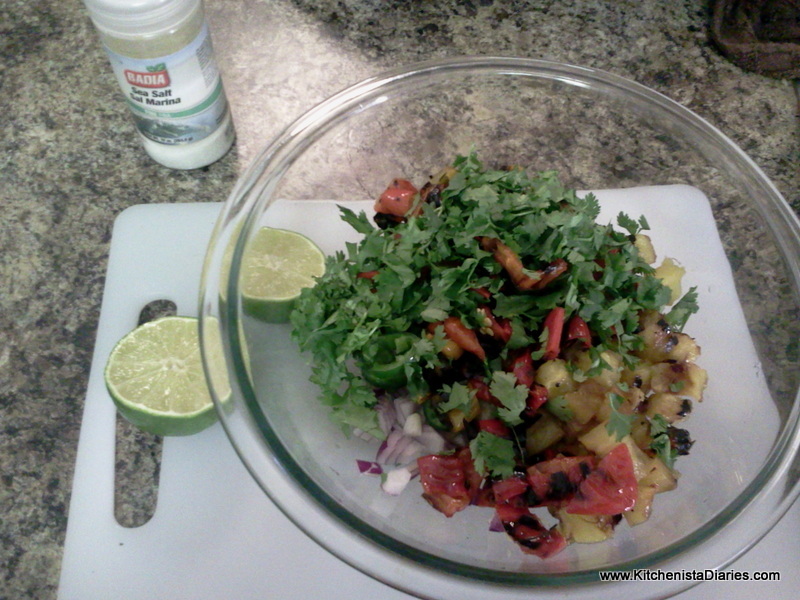 Likewise, if pineapple isn't your thing try using diced mango instead. 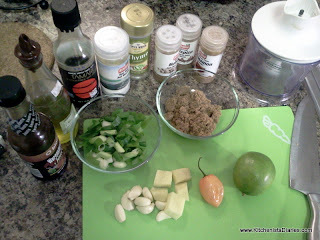 Gather the ingredients for the jerk marinade. The only real prep work here is peeling garlic and ginger, chopping up some scallions, and de-seeding the hot pepper. I wasn't sure how much heat the Tilapia would absorb so I only used one pepper; in hindsight it would have been fine with two. Scotch Bonnets are extremely spicy, so wear gloves when seeding and chopping them. I always use a separate cutting board and knife when working with Scott Bonnets. It's just too easy to forget what you touched and end up burning your lips or eyes later...trust me on this! 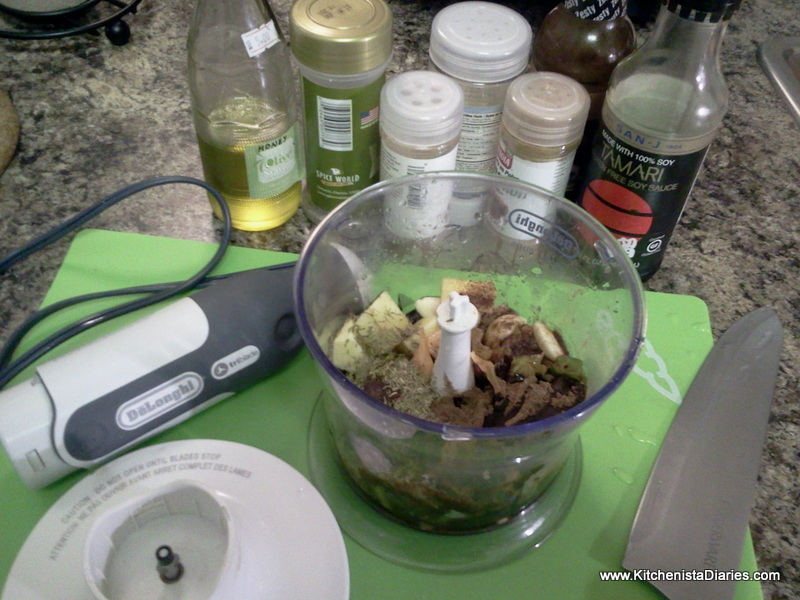 Combine all marinade ingredients and blend in a food processor or blender until smooth. Taste and adjust seasonings if necessary. Rinse and pat dry the tilapia fillets. 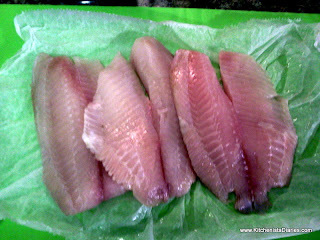 If you happened to be using frozen fish, it needs to be fully thawed first. Add the tilapia to the jerk marinade, turn to coat both sides. 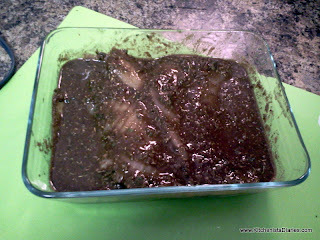 Cover and refrigerate 30 minutes or up to 1 hour. While the fish is marinating, prepare the salsa. 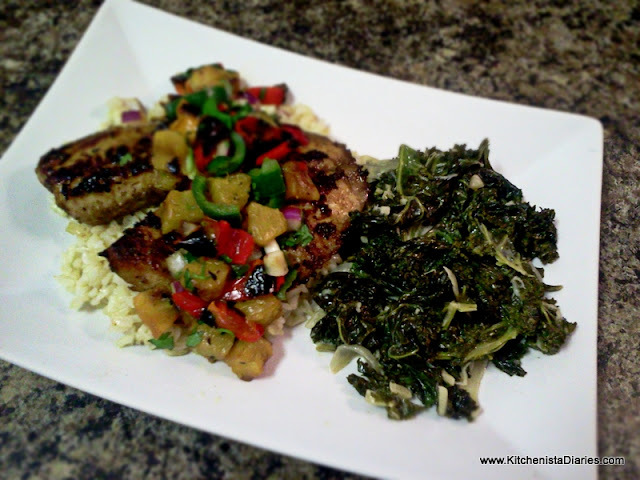 This can easily be done on a small indoor grill so go ahead and plug in that George Foreman! 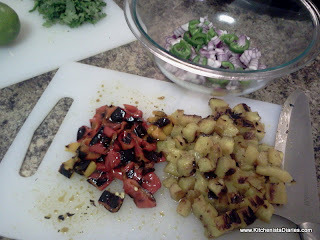 The mini sweet peppers don't have much inside them, so I decided to just cut off the tops and grill them whole. Rinse them in cool water and toss in a little olive oil. 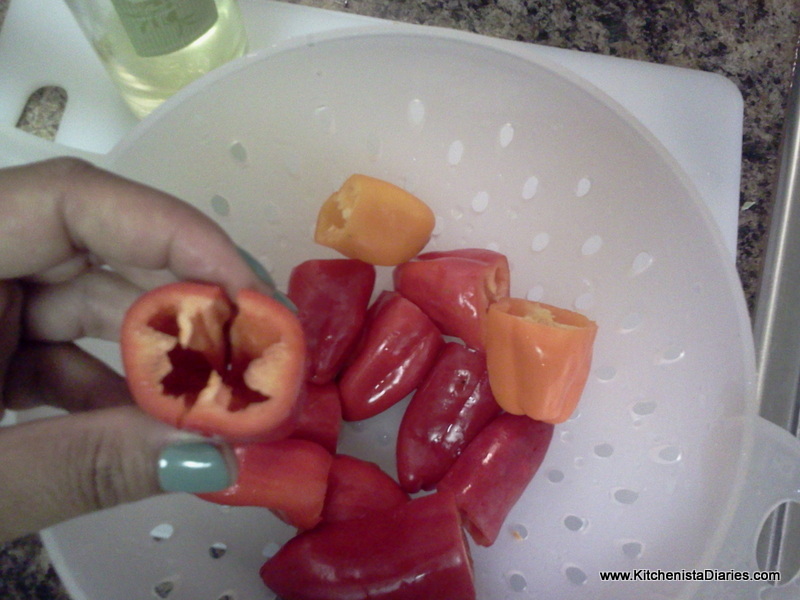 If you're using bell peppers, you'll want to remove the seeds, core and membrane and quarter them. Grill the peppers until they're blackened with grill marks and have softened, approximately 5 minutes. I used that time to cut my pineapple. I used to be totally intimidated by the thought of having to cut these things up so for years I stuck to canned pineapple. After I learned how easy they are to cut up, I felt pretty silly about that. (1) Slice off the tops and bottom. (2) Slice off the sides in six pieces - makes a hexagon shape. Use your knife to trim off remaining seeds. (3) Cut the pineapple in half lengthwise, cut each half into thirds. 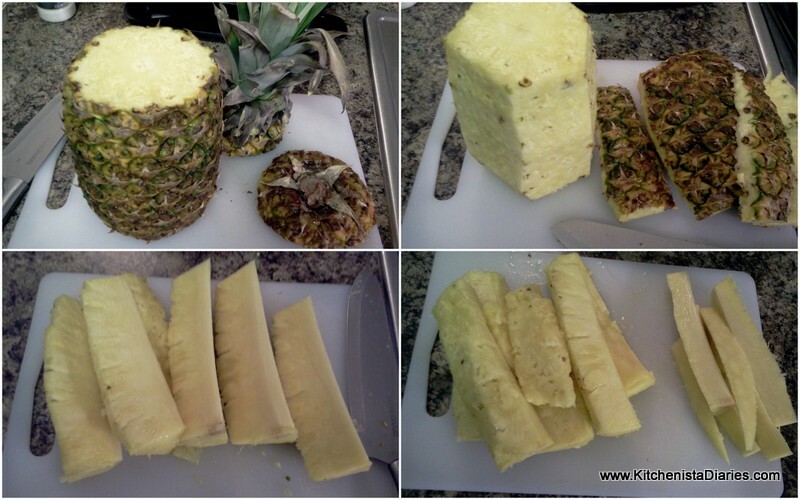 (4) Cut off the core from each pineapple skewer and discard. In the bottom right picture, the skewers to the left are what remains. Grill the pineapple skewers for about 3 - 4 minutes per side. Keep an eye on them as the sugar burns pretty fast. 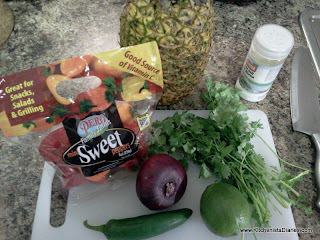 Also the pineapple will soften up considerably if over-cooked, making it hard to dice for salsa. 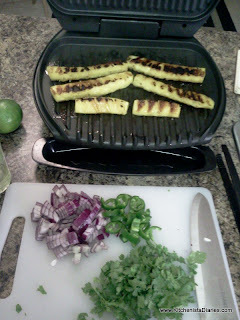 While the pineapple grills, dice the onion, roughly chop the cilantro and de-seed the jalapeño. I cut mine into rings but if you're more sensitive to hot peppers you may want to dice it. 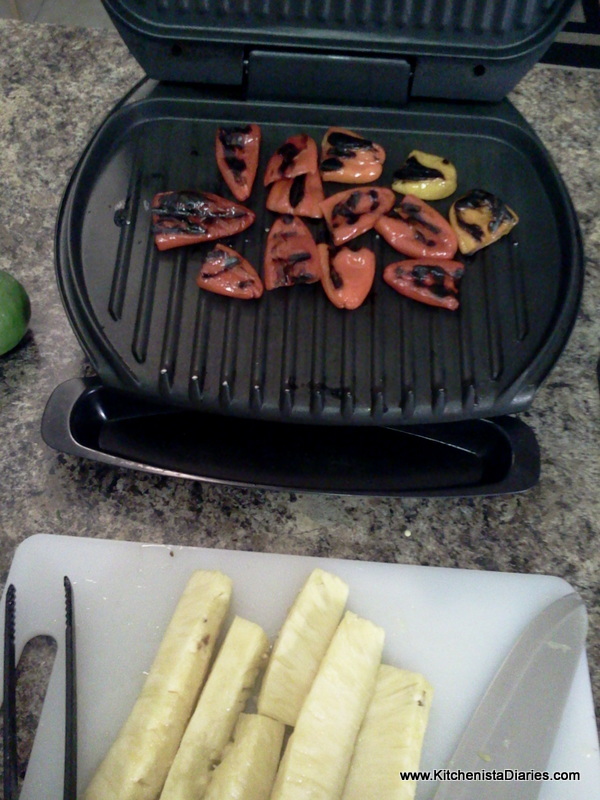 After removing the peppers and pineapple from the grill, allow to cool completely. 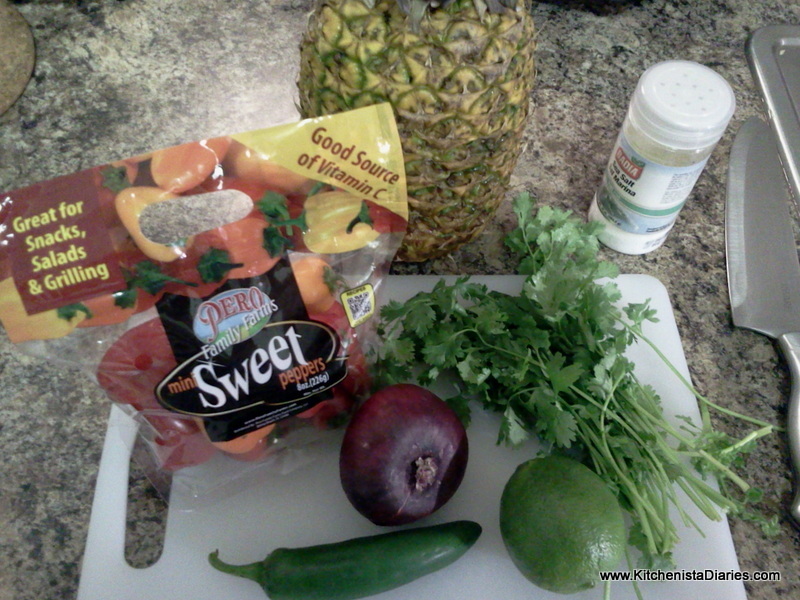 I sliced the peppers into small rings and diced the pineapple. Combine the grilled peppers, pineapple, onions, jalapeño and cilantro in a small dish. Squeeze the juice of one lime over the salsa, toss gently to coat and season to taste with a pinch or two of sea salt. Preheat skillet to medium high. Add a couple tablespoons of coconut oil to the pan. 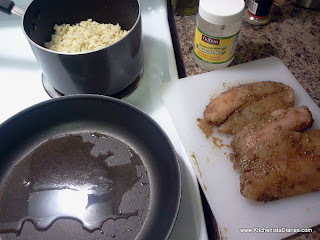 Wipe the marinade from both sides of the tilapia fillets; discard the marinade. Cook tilapia 2-3 minutes on one side (a minute or so longer if you have larger fillets.) Don't crowd the pan. Place the fish in the pan and let it be, this helps it to get a good sear. 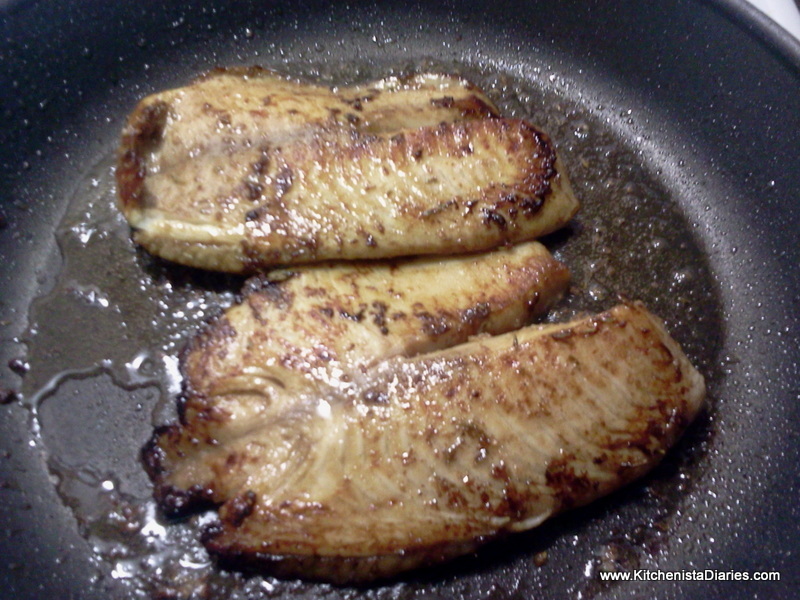 Carefully flip the fillets over using a spatula. Cook another couple minutes until done, don't overcook. 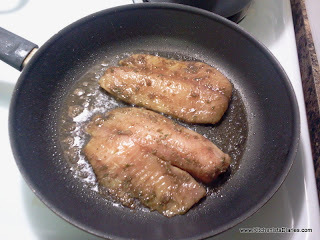 The brown sugar from the marinade adds a nice caramelized crust to the fish. 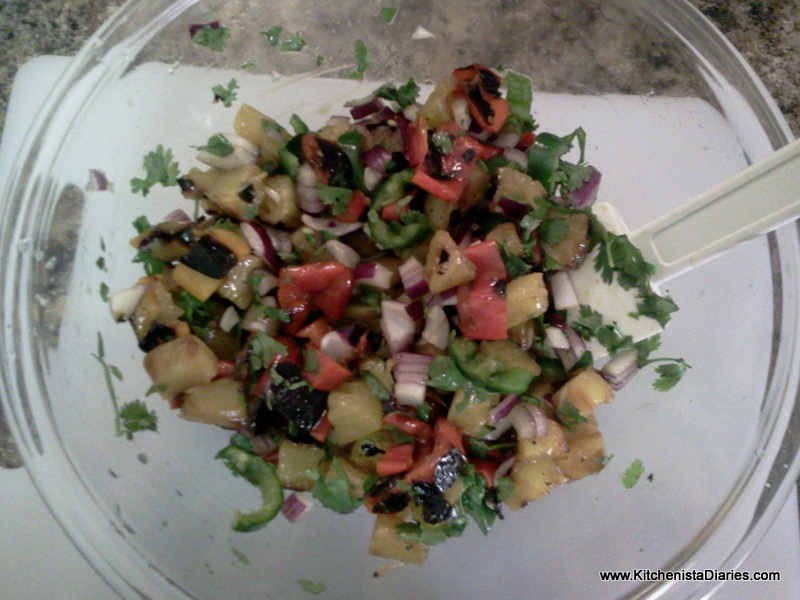 Serve immediately, topping with the Grilled Pineapple & Sweet Pepper Salsa. I completed Sunday's dinner with cooked plain brown rice and a side of Coconut Braised Kale.